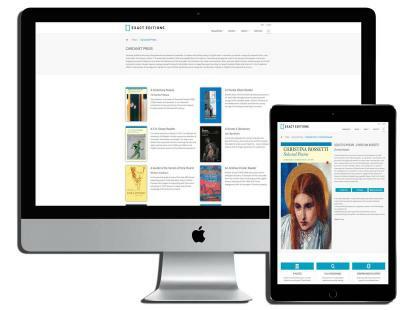 Carcanet Press has partnered with digital publishing experts Exact Editions to launch an innovative digital platform for the Carcanet collection, including a wide-ranging selection of poetry and prose. The Carcanet Collection gives subscribers a collection with over 70 notable works of literature and literary criticism, which will grow over the course of 2017 to include approximately 100 titles. The expanding collection includes significant works from the poets laureate of Jamaica and Wales, in Melvyn Morris and Gillian Clarke respectively, as well as a debut from Joey Connolly and highly anticipated works from Sinead Morrissey and Caroline Bird. This extensive collection of titles makes the Carcanet Collection an essential subscription for any lover of the literary arts. The digital book collection utilises Exact Editions’ cutting edge reader technology, staying faithful to the original format of the printed works, whilst also offering an enhanced reading experience that can be accessed on a vast range of digital devices including web, iOS and Android apps. The advanced search functionality gives the reader an enhanced experience, as subscribers are able to quickly browse and cross reference this vast collection. Interested readers can purchase an annual subscription to the Carcanet Collection for £49.99 from the Exact Editions shop. Each month Carcanet will announce a new promotion where readers will be able to access entire collections for free via the Carcanet Evaluation Window, for one month only. Click here to view the current promotion.